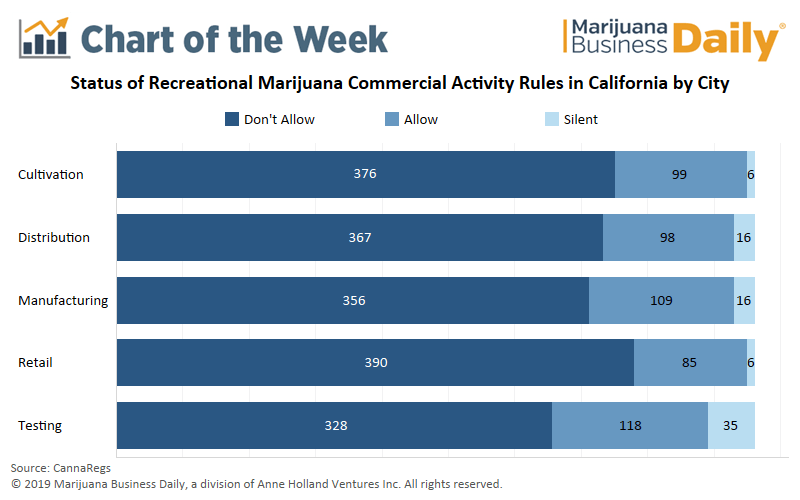 Two-thirds of California municipalities prohibit marijuana businesses from setting up shop, underscoring the hurdles MJ entrepreneurs face in trying to break into the world’s largest legal cannabis market. Only 161 of California’s 482 municipalities and 24 of the 58 counties have opted to allow commercial cannabis activity of any sort, according to data from CannaRegs, a website that tracks local marijuana rule developments in the state. In short, getting into the California market isn’t as simple as walking into San Francisco or Los Angeles and filing paperwork to start a marijuana store or grow.In addition, many of those local jurisdictions are selective about the type of cannabis business they allow, such as testing labs only. Others permit medical marijuana companies but not recreational businesses. The state remains a patchwork of regulations and rules, with most local jurisdictions choosing to implement their own regulatory schemes on top of state rules.